All posts I’ve made on this site. Latest news, progress, disasters, mileage, power produced… plus other sustainable / green projects that might be of interest. To isolate posts on a specific subject (e.g. ‘chain’ or ‘design’ or ‘others’) click the relevant word in the menu. A half-day of twiddling… making a new, thinner, front plate for the alternator… attaching the racers rear-wheel cogs again… balancing the turbine with bits of lead flashing… and it is paying off. Because most of the thumping and thudding is gone when I pedal. I say ‘most’ because, when pedaling fast enough to produce more than 13.5v, there are still times when the chain skips over some cogs. The resulting thud and jolt is nerve-wracking to say the least. Never mind what it might be doing to the bike, chain, turbine or floor! In case you are daft enough to take on this project yourself, what I think is happening is that the alternator is being pulled forward, toward the bike, with every down-ward pedal. As this is when I’m applying the most force, and that force has a beat / pulse in it, a pulsing momentum begins to build up in the turbine. Then, not being a robot, one of my downward pedals is slightly weaker/stronger or slight out of rhythm and !!-BANG-!! the chain skips a few cogs on the alternator. 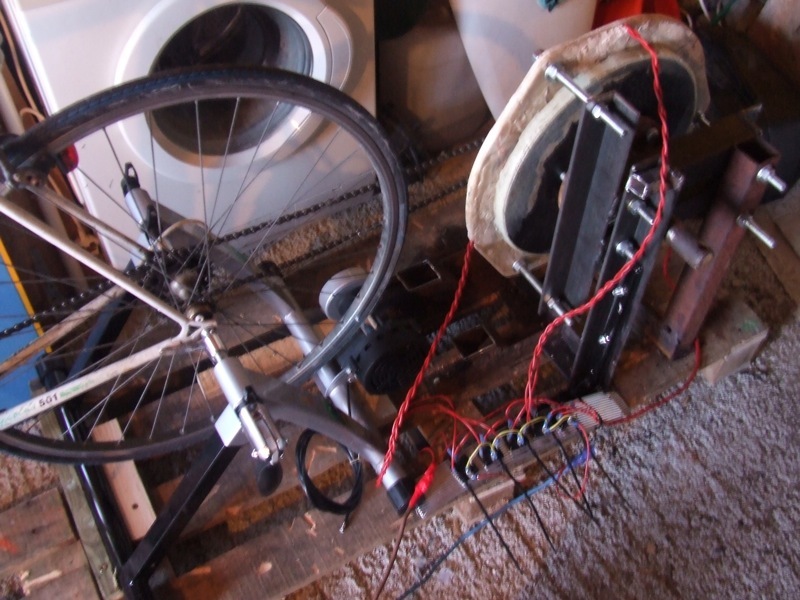 At a guess, that problem is exacerbated by the fact that the wood in the pallet might be bending slightly allowing the turbine lift and tilt toward the bike with every downward pedal strokd. But what it all amounts to is that the chain sporadically slips/skips a few cogs and there’s a massive chunk from behind me. Which ain’t good for turbine, bike or rider! 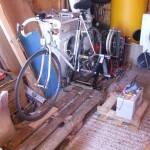 So the next step is to brace the alternator against the bike training stand. Once done the unit should finally be functional enough to allow me make electricity in comfort. Without fear of chains jumping or alternators getting thumped to bits!! This entry was posted in Blog, Design, Turbine on March 24, 2012 by Sean Callagy. Finally persuaded a friend to visit and turn the pedals while I watched to see if I could spot what was causing the jumping around. From what I could see the cause is most likely to be balancing… or lack thereof. The wobbles are tolerable while the turbine turns slowly. 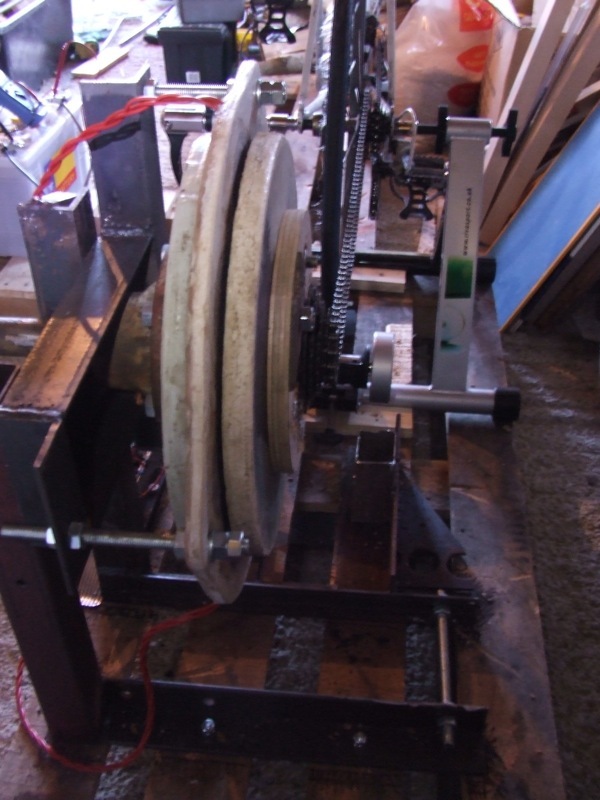 But once things begin to speed up it takes on a regular pulsing sound and movement – that might be exacerbated by the shape of the piece of metal onto which the cogs are welded. 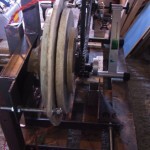 Talking with Eirbyte about this, the solution might simply entail replacing the existing wooden disk with a larger one. Then putting lead weights on various parts of that bigger disk to balance the rotor as it turns. I might also replace the existing piece of metal onto which the cogs have been welded. Because it itself is probably not helping. However I could balance the turbine without doing that… so it’s really a cosmetic desire. That said I’ll only do it if grinding off the current back plate could be done without damaging the cogs. But now have hope that I can get rid of the thumping and vibrating. It’s about the only thing stopping me clocking up the miles! This entry was posted in Blog, Design, Turbine on January 18, 2012 by Sean Callagy. … but my battery weighs a good 20-25kg and seems weighty enough to keep the back-end of the pallet from jumping so much. Which is great in that the impact vibrations are practically nil on the alternator now. But now there’s a new problem: I’M NOT HEAVY ENOUGH-!! I thought my weight would be sufficient to hold the bike stand (& bike) down onto the pallet. 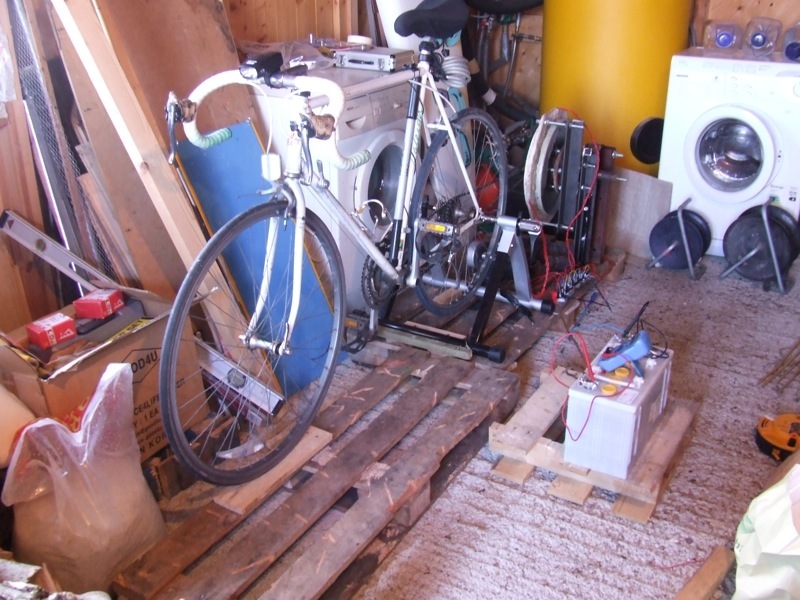 That there would be no need to clamp the turbo trainer down onto the pallet. But last night there were plenty of small lift-offs during a 23-min pedal. Which put me in mind of cycling along a bumpy Irish road (although the bumps in this instance were regular and predictable!). the pallet wood being too soft and so starts to bend up under the tension. So it looks like a better pallet is definitely on for starters. A ‘euro’ pallet would do nicely. Hopefully that, combined with a less taut chain,* will resolve things. If not then I’ll have to invent a brace from alternator to bike stand. * Should just be a matter of moving the chocks holding the turbo trainer in place. Simple job of unscrewing and moving them back slightly. 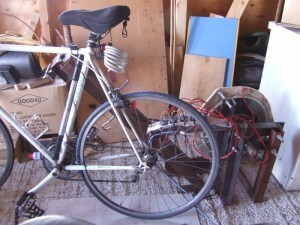 This entry was posted in Battery, Bike Stand, Blog, Chain, Design on December 16, 2011 by Sean Callagy. Racer should be an option soon! Because I found that an M18 nut will fit snugly onto the right, and an M20 onto the left, of the quick release back axle. I will have to grind a slot a few mm deep into the M20 nut to allow for the quick release lever – and hopefully won’t damage the blue locking inser (because it seems to provide some cushioning and grip*). 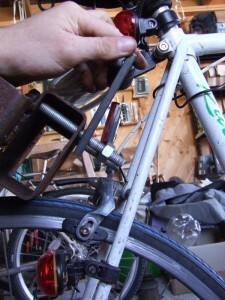 But it’s not simply a matter of drilling holes in the existing stand for some threaded-bar clamps. Because the current stand is far too narrow. So I think I’ll replace it with a built-for-purpose stand and weld that to the generator’s frame. 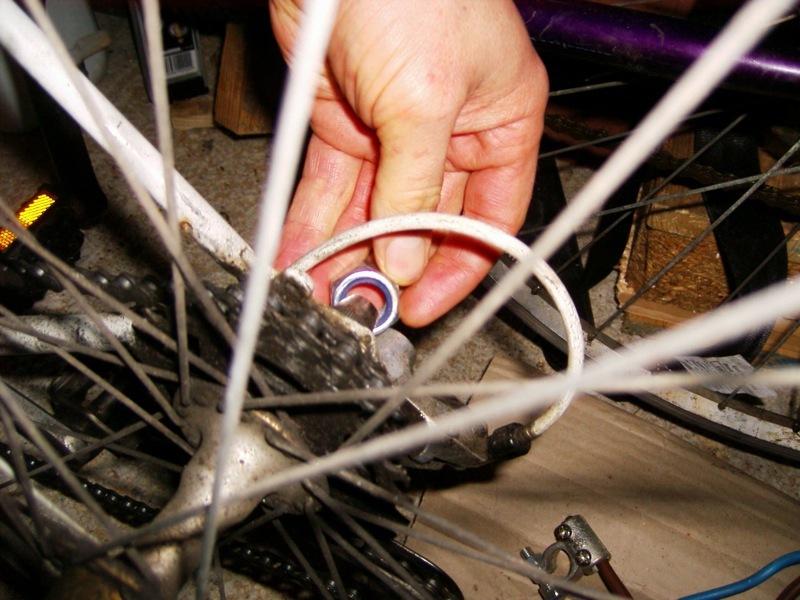 * The blue locking insert may not provide enough cushioning against vibrational / noise while pedalling. If so, I’ll try inserting some rubber washers. Or might step up the nut sizes to allow for more rubber to be inserted (e.g. M20 & M22). 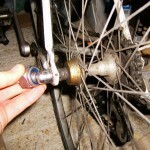 This entry was posted in Bike Stand, Blog, Design on October 29, 2011 by Sean Callagy. Ooops – the bike stand! Firstly, the angle of the main strut of the support frame is nowhere near the angle of the back forks of my racer. So the clamp wouldn’t grasp the frame properly and would also be likely to damage the frame – by focusing pressure on too small an area at the top of the forks. 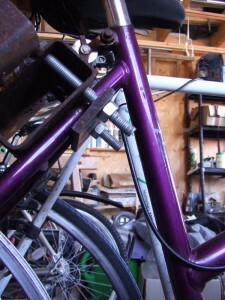 Secondly, the clamping arrangment at the top of the support frame is too low to the ground for my racer. It would need to be considerably higher to take my racer while also keeping the back wheel off the ground. My initial thoughts are that a modified-trainging-stand-arrangmement is the answer. 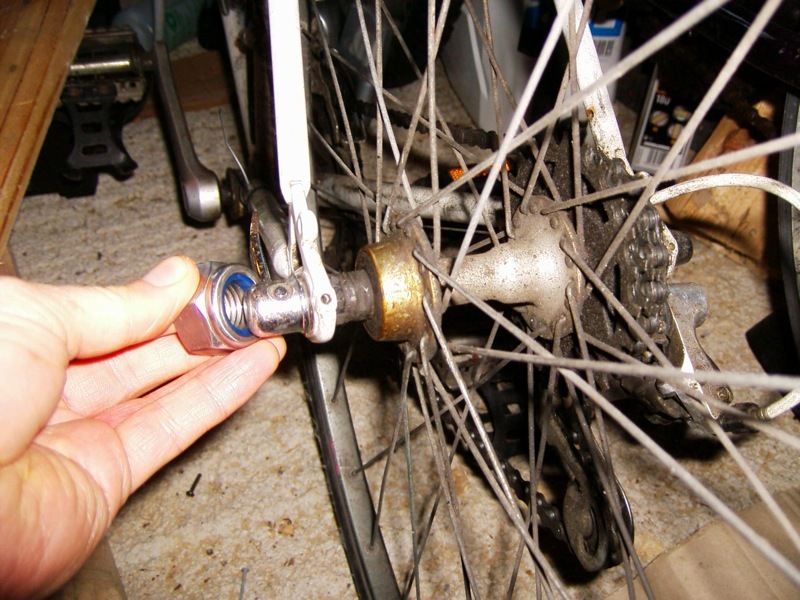 One which supports the bike via cup-shaped-clamps at the level of the back wheel axle. 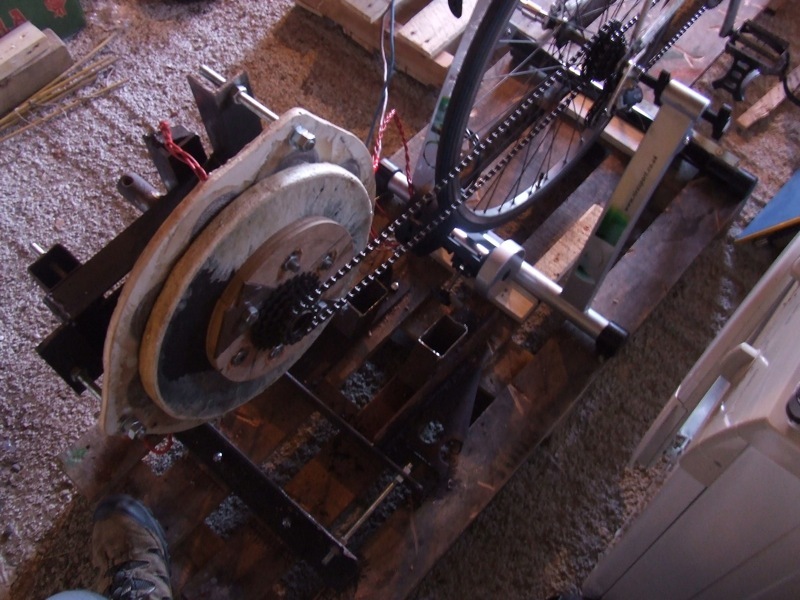 But it will also need to allow the bike be slid forward and away from the turbine before clamping (so as to ensure the connecting chain is kept reasonably taut). Time and experimentation will tell. But that arragenment appeals initially. Because not only will it allow quick release of my bike to get out the road but should also allow other bikes be hooked up. In case I ever get a new bike with bigger wheels. Or friends want to charge their own batteries on bikes that suit their body size. Anyhow, time for the pen and paper. Then some grinding and welding as I DIY a bike training stand. 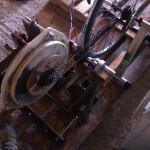 This entry was posted in Bike Stand, Blog, Design on July 10, 2011 by Sean Callagy. Sorry for the long delay – been away a lot and not had time to invest in the project itself or the website. I left the grid-powered battery charger trickling juice into the battery for about 48-hours. Battery voltage went up to 12.35 or so. I checked it over the subsequent days and it seemed to hold around the number. Then I got very busy and did quite a bit of travelling… but now, over a month later, the battery voltage has dropped only marginally to 12.27v. That suggests the issue is NOT with the battery. I just didn’t put in enough pedalling for long enough. After all I had deliberately drained the battery to ‘inverter-cut-off-alarm’ so maybe it was just that more pedalling was needed than I thought (mind you the general belief is that when you can get the input charge up to 14.5 volts the battery is as charged as it can be*). there’s something amiss with the rectifiers or something else within the turbike unit itself. But if it drops then there’s something wrong with the turbike’s electrics. * But maybe that theory isn’t quite accurate and I just needed to do more pedalling? This entry was posted in Battery, Blog, Electricity Generation, Recharging on May 21, 2011 by Sean Callagy. 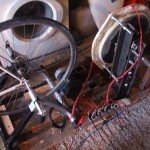 In my last post I mentioned I’d peddled for over 40mins and the voltage seemed to be settling about 12.0 – 12.1 volts. Turns out those voltage readings weren’t reliable. I’d come out every few hours to do a few more turns and the voltage would have dropped by anywhere from 0.2 to 0.5 volts. It took another 45mins of pedaling (during which I finally began to hit 14.5v during intense bursts ) before it became clear that the voltage seems to be settling about 11.9v. I talked this over with Eirbyte.com and they felt those kinds of numbers hint at there being a problem with the battery. It does not seem to be holding the charges I’m giving it. To check this out, I intend to charge the battery electronically to be sure I’ve got it maxed. Using grid electricity is not something I wanted to do in this project, but this seems to be the only way to make sure I’ve recharged the battery to full capacity. Then I’ll see what voltage it holds. If it’s not at least 12v then I’m back to the shop to get money back and (hopefully!) find a better battery elsewhere. Because no one deserves €115 of my money for a battery that doesn’t work after just one complete discharge. This entry was posted in Battery, Blog, Electricity Generation, Recharging on March 4, 2011 by Sean Callagy.